Details: The FLD500 Break Away Flow Limiting Device is designed with an internal flow control to substantially reduce the amount of water loss in the event of a sprinkler riser breakage. The irrigation system remains operational and balanced even in the event of multiple breaks in the system. The FLD500 can be easily removed and replaced quickly to minimize system down time, water loss and maintenance costs. The weak point engineered into the FLD500 will withstand a minimum abuse of 15 lbs. applied to the top of a 12" riser. Reduces water loss to 6 GPM maximum. 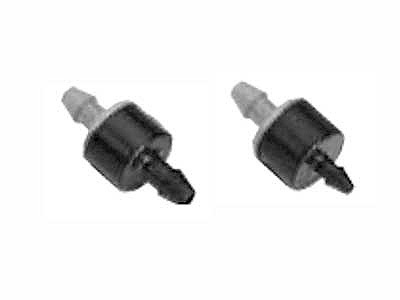 Easily installs at the base of any 1/2" riser. 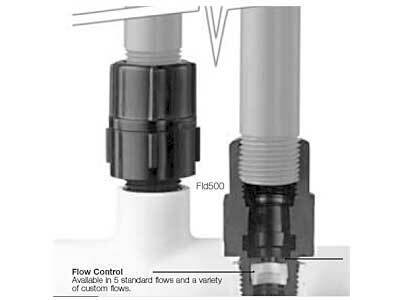 Details: The FC71 Flow Control Riser Adapter provides preset flow control for 1/2” irrigation devices. New or existing systems can be balanced, corrected for terrain elevation, pressure variation or design problems. Sprinklers with the FC71 Flow Control require no adjustment, helps to control fogging and reduces maintenance costs. 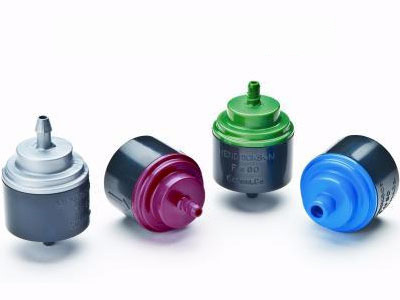 The flow control is conveniently color coded for easy identification and installs quickly at a minimal cost. Improved uniformity of spray pattern. Controls nozzle fogging and conserves water. 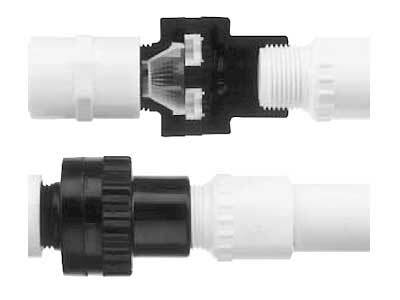 1/2" MIPT outlet fits all irrigation devices with 1/2" FIPT input. 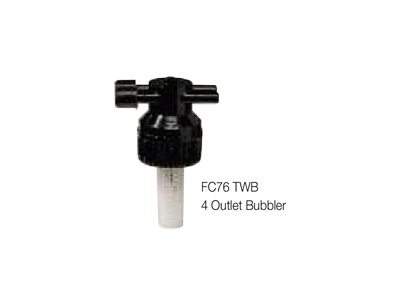 Details: The FC76 Air Jet Bubbler offers a constant and gentle water flow in system with line pressures up to 100 psi. The FC76 has no moving parts and requires no maintenance or adjustment. 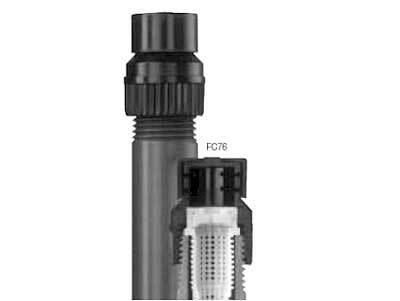 The simple patented design of the FC76 offers the user precise and consistent flow control. The slow, measured water flow utilizes water resources efficiently. Consistent flow rate that compensates for pressure variation caused by terrain elevation or friction loss. Fits all standard 1/2" risers. Available in .15, .25, .50, 1.0, 2.0 GPM flow rates. The desired flow, in a gentle, bubbling action. 4 outlets which fit 1/4” tubing (.187 ID). Available in 3 flow rates, 4, 8, 12 GPH. Operating pressure 18 to 100 PSI. Comes with 2 caps to cover unused outlets. Details: The FC70-A is for agricultural and industrial applications. 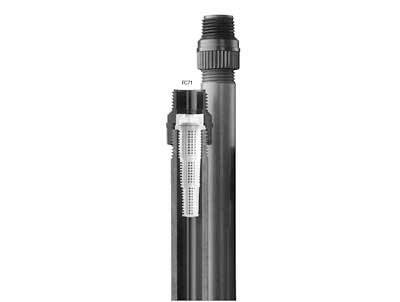 The FC70-C is custom designed and balanced to your specific irrigation device. Hendricksons patented flow technology is the heart of the FC70; an economical way to add pressure compensation to a variety of water emission devices to optimize their operation. Standard flows are available in a range to meet the specific recommended flows of most manufacturers of geardrive/impact sprinklers, bubblers, spray heads, and low volume sprinklers. 14 standard flow rates and custom flows available. Effective in balancing irrigation systems where elevation is a problem. Add pressure compensation to any water emission device, simply and economically. Details: The 'HM' is a self-regulating flow control device, combined in one piece, with a standard 3/4" hose washer. 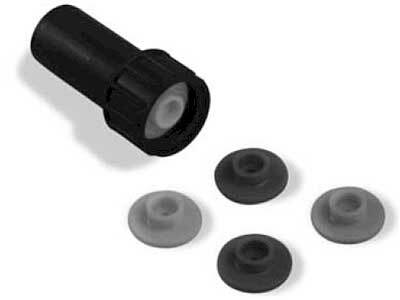 Can be used to regulate drip emitter, mini-spray or trickle tape systems fed through 3/4" hose connections. Effective for balancing your system. Makes drip hose or tape, pressure compensating. 16 standard flow rates and custom flows available. Details: The FC77 optimizes the performance of micro sprayers by balancing line pressure for uniformity and providing consistent flow rates in spite of differences in terrain elevation or friction loss. Details: The FC79 High Volume Flow Control is designed for applications that require flow control and water distribution balance. This flow control is an excellent way of assuring that a specific amount of water is delivered to the end user, avoiding waste and conserving water. The FC79 provides precise pressure compensation and uniform flow for applications where pressure variation will cause inconsistent flow. 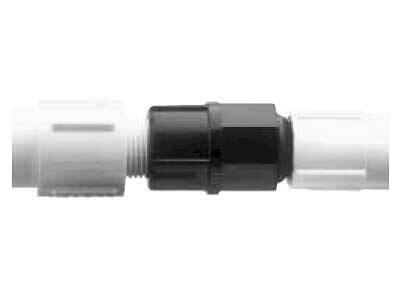 Details: The FCC80 Flow Control Check Valve is the latest innovation from Hendrickson Bros., the leader in drip irrigation. It keeps pressure constant ensuring consistent flow across varying terrains. Like all Hendrickson Bros. products, the FCC80 is built to be rugged and long-lasting, ensuring optimum performance with minimal maintenance. Constant flow rate compensates for terrain elevation changes or mainline friction loss. Provides consistent micro sprayer spray pattern regardless of pressure changes. Ideal for fertigation as mainline is always primed. Reduces runoff, erosion and waste. Saves on pump horsepower and pipe sizing.